My first experience with Studio Ghibli was watching Princess Mononoke. I had never seen Japanese animation before and was unprepared for the style, the action, and the dubbing. It was an art form that I wouldn’t appreciate until years later, even though the studio was becoming famous worldwide. Mononoke, Spirited Away, Howl’s Moving Castle, Ponyo, Arrietty, The Wind Rises, When Marnie Was There; these are some of the most widely-known and successful animated movies of all-time, though Americans continue to prefer Disney, Pixar, and other local animation studies. But the power of Ghibli can’t be denied, as their films are an artistic medium all on their own and continue to amaze us with wonderful stories brought to life with dazzling talent. Based on The Borrowers, a novel written in 1952 by Mary Norton, Arrietty concerns itself with a world beneath our notice. Young Shawn, a boy with a weak heart, moves into the country to await an operation. While there, he encounters a girl the size of his thumb whose name is Arrietty. She lives with her mother & father under the floor of the human house, borrowing objects from the world above to furnish their house & survive. They are a proud family, never intending the humans any harm and attempting never to be noticed. 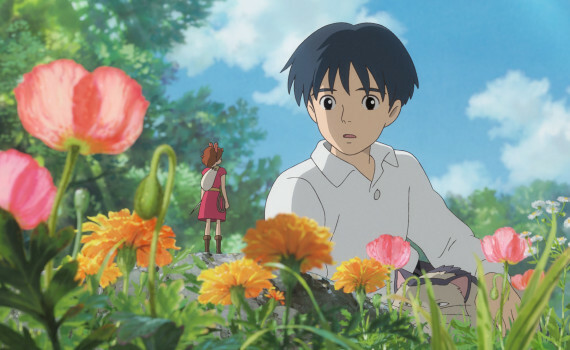 But Shawn’s curiosity coupled with Arrietty’s adventurous streak creates a situation that is dangerous to both, forcing the tiny beings to move away and threatening a unique friendship that was just blossoming into something special. I remember the book and love the way this film presented it. It’s odd that the English novel was transformed into Japanese animation and then dubbed by American actors, but the story itself is simple enough that nothing is really lost in translation. Studio Ghibli has perfected the visuals of their style, creating color & background that are unrivaled, with characters presenting the action across a stunning set. And the music was tremendous, creating a mood that sweeps audiences away and allows them to enter Arrietty’s world without a moment’s hesitation. The film does without the humor and roller-coaster of emotions that American animation use as staples, developing a more even feel with an intensity of detail in each scene that is more adult and less childish than perhaps we’re used to. But given the chance, this genre will impress you with its professionalism, its dedication, and its beauty, aspects that are too easily & too often set aside when it comes to children’s movies. Arrietty is art for everyone, and should be appreciated as such.